The cities of Helsinki (Finland) and Tallinn (Estonia), recently signed an agreement to develop a rail line connecting the two capitals via a 92km (57.2 mile) tunnel beneath the Baltic Sea, reducing the current journey time of 1h 40min (by ferry) into just 30min. This link will melt the two capitals into a single metro area of 1.5 million citizens. As part of the tunnel project, the two cities have also agreed to harmonize their current transit arrangements, including a joint travel pass for both cities and park and ride schemes. 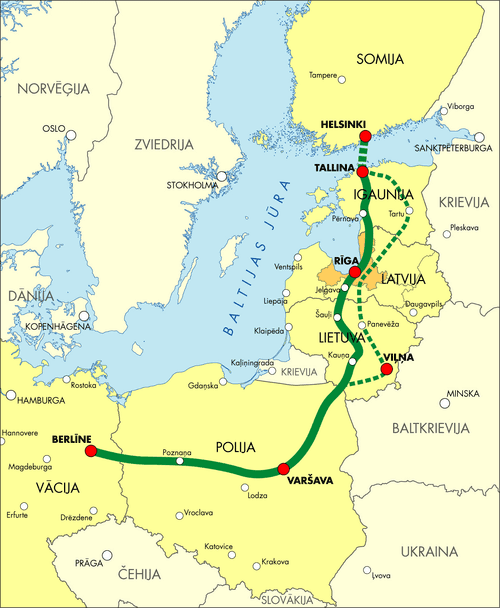 This goal is being pushed forward by another key infrastructure project: a high-speed rail link joining the Baltic States’ capitals with Poland and Berlin called Rail Baltica. This project was identified as a priority project by the European Commission (TEN-T), encompassing the present Priority Project 27 and Rail Freight Corridor 8 (Rotterdam – Kaunas). Rail Baltica took recently a major step forward with the signature ofthree CEF Grant Agreements.